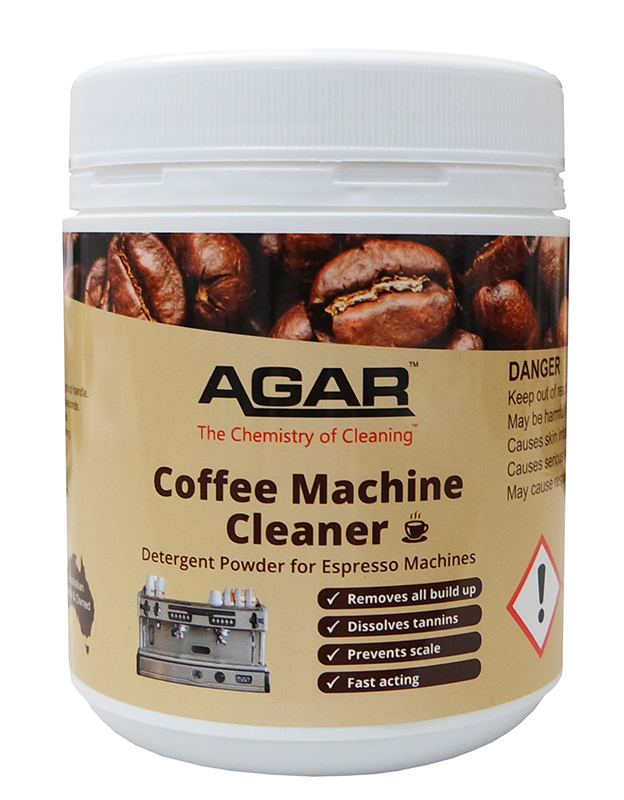 Agar Coffee Machine cleaner is an effective, safe, fast-acting detergent powder for cleaning the brewing unit in espresso machines. It removes coffee residues from the shower, filter and group handle. It contains a blend of sodium percarbonate, alkaline salts and other ingredients that dissolve and oxidise tannins and proteins. It will not extract metals from the internal surfaces of the machine and is safe on brass components. It is also a good stain remover for soaking cutlery, teacups, saucers and plates in the café and kitchen prior to dishwashing. 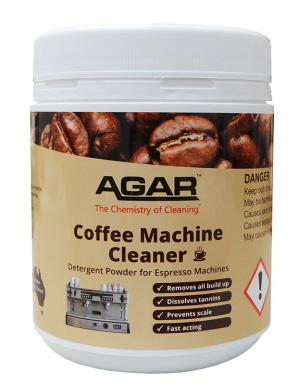 With regular use of Agar Coffee Machine Cleaner, it ensures you make a better coffee! Descaling Liquid. 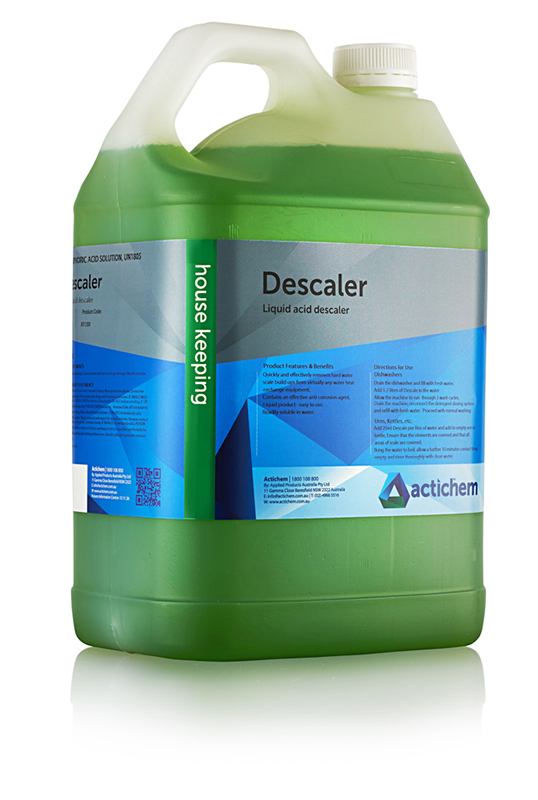 Liquid descaler for descaling dish washing machines. Peerless Machine De Scale Powdered safe handling acid cleaner formulated for the effective removal of scale and hard water deposits from dishwashing and glass washing machines. 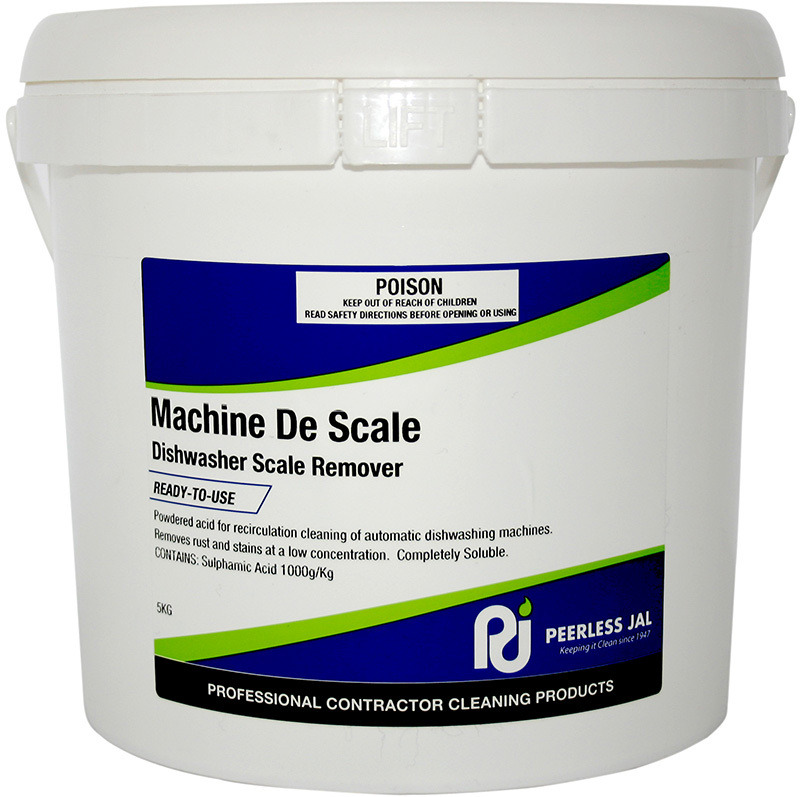 May be used as an acidic cleaner for removing rust, calcium and scale deposits from urinals, sinks and baths. 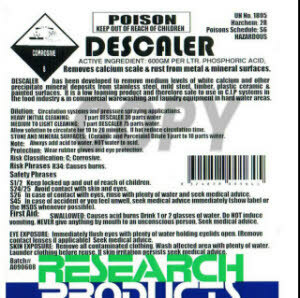 Descaler from Research Products is highly active against hard water scale in dish washers. It removes medium levels of calcium scale, rust and other mineral deposits from stainless steel, mild steel, timber, plastic, ceramic, mineral and painted surfaces. R.C.L. 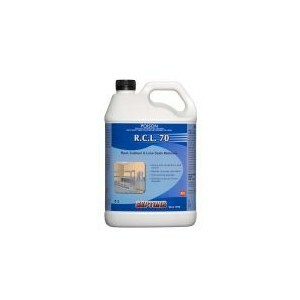 70 is a powerful acid cleaner suitable for the cleaning and descaling of surfaces such as stainless steel, steel, brass, copper, ceramic and glass. R.C.L. 70 will remove rust, calcium and lime deposits from food processing equipment found in hotels, breweries and dairies; and restaurant equipment such as hot water urns, bain maries and dishwashing machines. Available in 5L and 20L. An all purpose descaler for use on kitchen equipment and utensils including dishwashers, bain maries, boilers, steamers, tea & coffee urns etc. 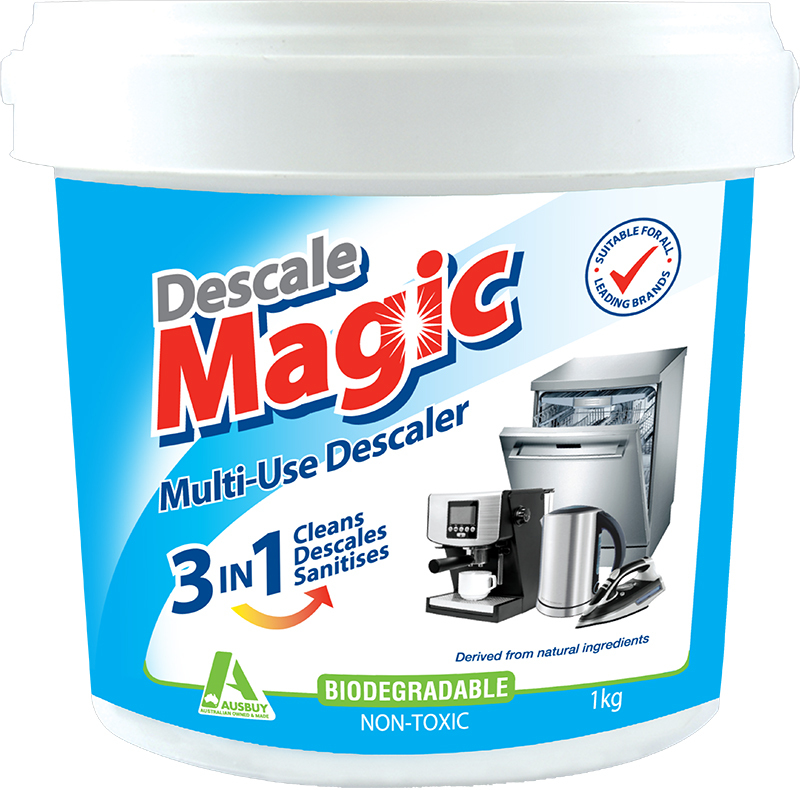 Descale Magic is a biodegradable and non-toxic 3-in-1 multi-use descaler to remove calcium/lime scale deposits in your coffee machines, kettles, urns, dishwashers, baby sterilizers, steam irons and showerheads. 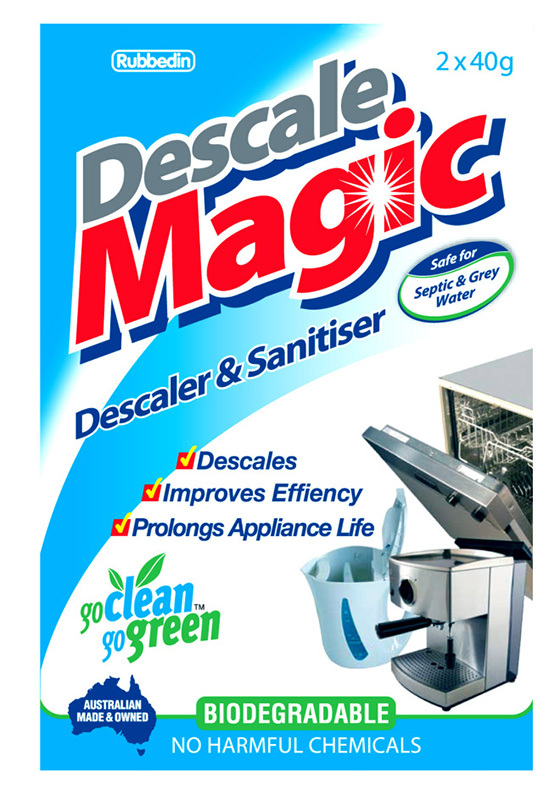 Cleans and Sanitises: Powerful 3-in1 formula removes built–up limescale/calcium deposits leaving appliances free of germs and detergent remnants. Descales: Regular descaling improves appliance efficiency and longevity. 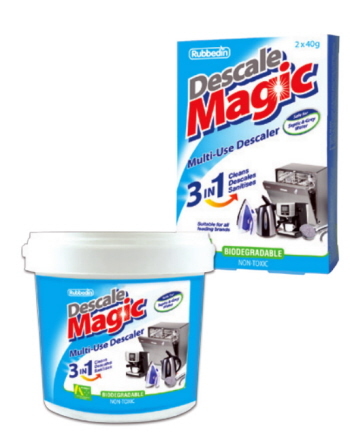 It is suitable for use in kettles, urns, coffee machines, dishwashers, steam ovens, steam irons, bain-maries, baby bottle sterilisers, shower heads and water coolers. Organic & Foodsafe: 100% organic formula is safe to use on all leading coffee machines. Available in 2x40g & 1kg. 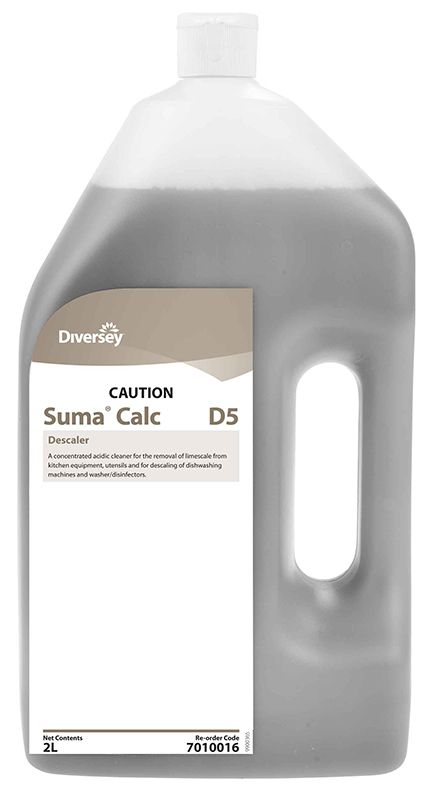 Jasol Sulphamic Acid 10% for acid cleaning and descaling applications. It is powerful yet safe. It has no fumes, no objectionable odour. Excellent salt removal properties. White crystalline solid. Non-volatile. Non-hygroscopic. Combustible. Low toxicity. NZFSA Approved.